Atletico Madrid have won the 2018 UEFA Super Cup courtesy of an extra-time 4-2 victory over city rivals Real Madrid in Tallinn this yesterday. 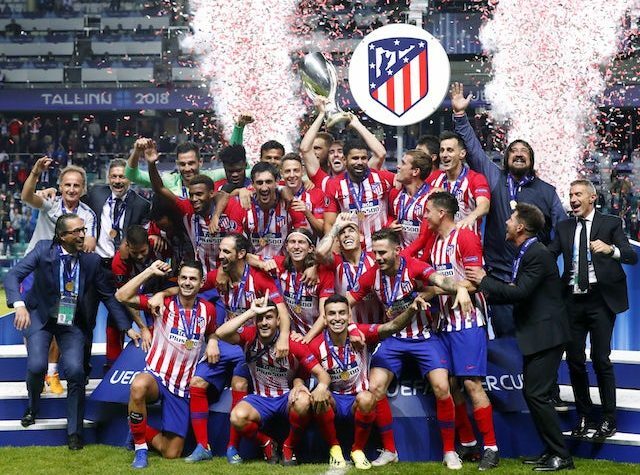 The first ever Super Cup final between two teams from the same city saw twists and turns galore, but ultimately it was Europa League winners Atletico who came out on top as Julen Lopetegui’s first match in charge of Real ended in defeat. Atletico took the lead inside the very first minute through a fine solo effort from Diego Costa, but Karim Benzema levelled things up before half time and Sergio Ramos scored from the spot to put Real in front shortly after the hour mark. Costa doubled his personal tally 11 minutes from time to force extra time, though, and strikes from Saul Niguez and Koke in the first period of the additional 30 saw Atletico win the trophy for a third time in their history.